The S-Bahn circles the city's center, at last arriving at Treptower Park Station. On one side of the street a massive open and green public space along the Spree River, extending further than eye can see. On the other the city and structures of Berlin. I lug my heavy bag over my shoulder with its toasted wheel down the clean streets, making my way past bakeries, restaurants, bars, and apartment buildings. Settling in for a moment, my hosts give me a quick account of their beloved city, describing it as far more diverse, and much less conservative than the rest of Germany. The Treptower area is former East Berlin, and today quite trendy, a center for artists, hippies, and musicians. I head back to the park, a huge green space interwoven with hiking trails and bike paths criss-crossing through small vestiges of forests. Every tree in the park, and in all of Berlin, is assigned a number, and kept track of by the government. 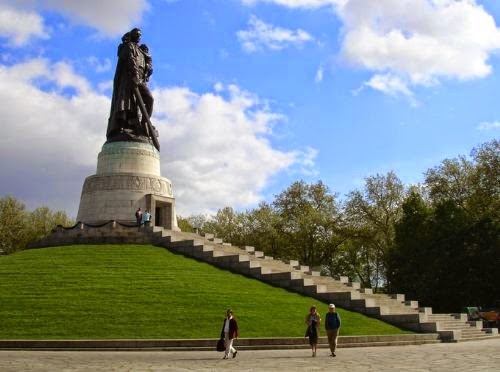 Treptower is home to a huge and imposing Soviet war monument, constructed from material rightfully ripped out of former Nazi headquarters. Exploring, I walk several kilometers through the woods and realize that I'm running out of bread crumbs to find my way back out. I come across a gingerbread/candy house. I'm pretty it's a project constructed by one of the Treptower's more avant-garde artists, but I elect to continue past. I find my way to the street, stop at a restaurant and order a German beer and some schnitzel. I wouldn't call Berlin charming, but it is incredibly interesting. I finish my meal and consider dessert. Fortunately prices here are cheap enough I don't have to go back for the gingerbread.